8" Freak XL insert version. 0.697" post-bore and quad porting. 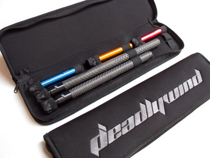 The Deadlywind Fibur-X8 carbon fiber barrels are ultra-lightweight, accurate, and quiet. They utilize the Freak XL(tm) 8" replaceable inserts, so one barrel and a few inserts will do the job of multiple barrels. And with the ability to affordably swap to different threads, the Fibur-X8 has you covered! 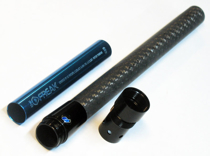 The Fibur-X8 barrel system consists of three parts- The thread adapter to match your gun type, a carbon fiber "main-barrel" which is the main part of the barrel (sets the length), and a FreakXL insert which sets the bore of the barrel. Note- You MUST use a GoG "Freak XL" 8 inch insert with this barrel. 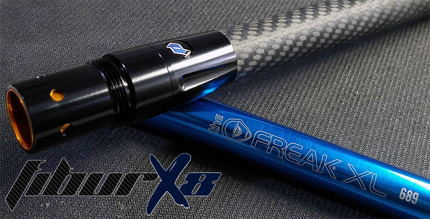 Unlike other carbon fiber barrels, the Fibur-X8 barrel is built with a unique 3 layer construction. 2x2 satin Twill external, uni-direction fibers laid up in a strong multi-vector pattern, and then a super slick "Silkfiber" inside that can be safely swabbed. CNC align-bored segment for the insert area, CNC-ported with 4 rows of straight ports, and then hand-assembled and quality checked-- You can't get any more accurate. Already have Freak XL inserts? Awesome. Need an insert to go with it? Buy one or go with the 3x inserts and save! We use LEFTY threads to join the Main Barrel to the Thread Adapter- no bits getting stuck in your gun! You must have at least a "Thread Adapter", a "Main Barrel", and a "Freak XL insert" to use this barrel system.